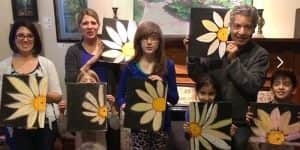 $30 Per Person Art Parties and Mini Workshops: Perfect for birthday parties, a get-together with friends, bridal and baby showers, family fun, team building for your office, or a custom lesson for your private group! Better than Paint and Sip: We are an art school and our teachers are fine art instructors. Our teachers will make it easy for everyone to succeed even if they have never painted before. We teach real art techniques and we can customize the image or project for you! Groups of six or more can book a teacher for two hours to lead the group through the art activity of your choice. We will provide the instructor and materials, you provide refreshments of your choice! These can be organized for a group of adults, children or whole families. Parties can be held at our building for 6 to 30 people or held at your location for a minimum of 10 people. Rent Our Space for Your Meeting or Event! $500 for four hours: Rent our building for your meeting or event. We have tables, chairs available for your use. You may provide refreshments of your choice. We will have a staff member present for coordination and building access. Please contact the reception desk for more details and to schedule your date. Rent a room during our normal hours of operation (Mon-Sat 12:00-5:00 PM) for $50 per hour. Rent our wine glasses $50 for two dozen glasses. $40 per person Paint and Sip Fundraiser: Make the world a better place while having fun! Fundraisers are organized like Paint and Sip parties except that 50% of the fees will go to the charity or non-profit of your choice. Contact the reception desk for more information.